At the foot of Table Mountain is the fashionable working harbour that is the Victoria & Alfred Waterfront and in the heart of this exciting nightlife and entertainment precinct lies One&Only Cape Town. While this luxurious resort serves as a gateway to the uniquely rare adventures of South Africa such as wildlife safaris, wine country excursions, world-class golf and endless water play along pristine beaches, it is also a destination unto itself – an urban chic resort offering an unprecedented level of luxury in South Africa. With captivating views of Table Mountain, this contemporary resort features the largest accommodation in all of Cape Town, with a stylish island design and African flair accentuating the 131 spacious guest rooms and suites. A dedicated butlers service operates to all guestrooms, 24 hours a day Within the lobby of the seven-storey Marina Rise, the Vista Bar offers a high-energy vibe, providing a striking contrast to the serenity discovered on The Island, a tranquil retreat featuring a lushly landscaped free-form, infinity-edge pool. A 350m² free-form infinity edge heated pool is located on one of two private islands with private sitting areas, double chaise lounges and shaded trellis pavilions. The state of the art fitness centre with Kinesis and Technogym equipment features a personalised workout key for tailor-made exercise programs for both adults and teens. It is staffed by an experienced team of qualified personal trainers. One&Only Cape Town proudly boasts Africa’s only restaurants by legendary chefs Nobuyuki ‘Nobu’ Matsuhisa and Gordon Ramsay. Nobu’s is an inviting open space with a stunning piece of contemporary art adorning the ceiling serving an innovative blend of classically styled Japanese cuisine incorporating fresh South African seafood and indigenous spices in unique dishes such as toro tartar, rock shrimp and scallops in yuzu sauce. Maze by Gordon Ramsay is modelled on its incredibly popular British namesake and presided over by rising culinary star Jason Atherton.?? Prepared in an open show kitchen, a creative menu of tasting-sized dishes features the best in South African seafood and game as well as organic produce from local farms. Isola, the outdoor poolside restaurant, features casual Mediterranean cuisine and an innovative variety of cocktails from around the world. 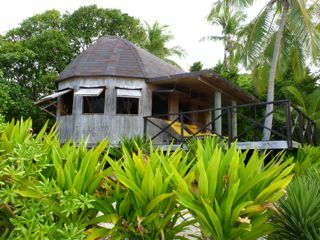 There are, in fact, two lush private islands — one featuring One&Only Spa and a second with 40 guestrooms and suites. A serene haven amidst the energy of a bustling city, the One&Only Spa, Cape Town’s most expansive, occupies its own private island and offers the Pedi:Mani:Cure Studio by Bastien Gonzalez. This is Cape Town’s most comprehensive luxury spa featuring 12 treatment rooms for single or couple treatments; vitality pools; private yoga pavillion; sauna and steam room; serene relaxation areas and private changing areas for men and woman; and a full service salon by Wayne, Cape Town’s most famous stylist. 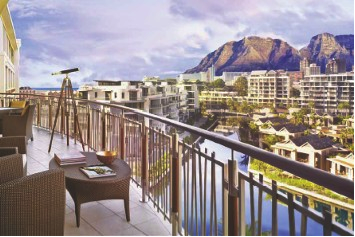 The resort’s seven-storey Marina Rise showcases 91 rooms and suites – the largest in Cape Town – each with its own private balcony offering uninhibited views of the picturesque harbourside and iconic Table Mountain. Located on a secluded and lushly landscaped island surrounded by a waterway, each of the 40 Island Superior rooms and Island Suites feature a private balcony or terrace and waterway views. Clean lines and contemporary art are accentuated by dark African woods in the air-conditioned rooms and suites. Oversized baths, roomy showers, private water closets and dual vanities vie for your attention with the in-room multimedia entertainment system , satellite flat screen televisions, DVD/CD players, mini bar, MP3 docking station and Nespresso machine. There’s complimentary Wi-Fi access and even a three phone, two-line communication system. The spectacular tri-level glass and steel Wine Loft showcases a magnificent collection of 5,000 bottles, up to 700 references and 80 available by the glass, complemented by the most extensive tasting menu in the country. A purpose-built KidsOnly Club offers complimentary fully supervised programs tailored to kids aged 4-11. Teen fitness programs and spa treatments are available for kids aged 12-17. Welcoming to both couples and families, One&Only Cape Town is the perfect setting for life’s most memorable moments.